Thailand’s popular Crown Princess Sirindhorn opened three days of raucous festivities in Bangkok’s Chinatown on Feb. 19, walked with the dragon dancers and mingled with the thousands of people who filled Yaowarat Road from end to end in celebration of the Chinese New Year. Sampheng ― an old name for Bangkok’s Chinatown ― erupted in noise, music and celebration over the three days that the main street, Yaowarat Road, is closed to traffic. Dragon and lion dancers, complete with crashing cymbals, roamed the area. By nightfall, the main big dragon was lit with LED lights and the red and multicolored paper lanterns formed a roof of light over the road, stretching more than 1 kilometer. The Crown Princess, one of the most popular among the royal family, makes it a point to visit Sampheng every Chinese New Year. It is a sign of the close bond that the Chinese community has formed with the country. For more than 400 years, successive Thai monarchs have welcomed Chinese immigrants and allowed them to maintain their own unique culture while assimilating in Thailand. The result: There is little or no useful distinction left any more between ethnic Chinese and ethnic Thai. Jitti Tangsithpakdi, 74, chairman of the Gold Traders Association and a member of the executive committee of the Thian Fah Foundation Hospital, remembers how he started on Yaowarat Road more than 50 years ago, selling anything he could get hold of on the street at night, after finishing a day’s work at the bottom rung of the family’s gold business. Today, in a black chauffeur-driven Rolls-Royce Ghost, he glides to a stop outside his own gold shop on that very street. “If you want gold, you have to come here,” he said. “On this one street, Yaowarat, just about 1.2km long, there are around 100 gold shops. Like most ethnic Chinese, Jitti grew up bilingual, learning and speaking the Chinese dialect of Teochew and Thai. His business card is trilingual ― in Chinese, Thai and English. But today, for the most part, like almost all the residents of Sampheng, he speaks in Thai. His nine children speak Teochew ― the most common Chinese dialect group in Sampheng ― but only from picking it up from elders in the family. They do not make any special effort to learn it. Their first language is Thai. In Thailand, Chinese immigrants have merged and blended into the culture of their homeland, taking Thai names, speaking Thai and becoming Thai. Thailand’s business and political elites are Thai Chinese. Several of Thailand’s prime ministers have been Thai Chinese: Banharn Silpa-archa, Chuan Leekpai, Abhisit Vejjajiva and Thaksin Shinawatra, for example. “It is very difficult to say one is a Thai Thai,” said Dr. Supang Chantavanich, director of Chulalongkorn University’s Institute of Asian Studies. The Thai identity is “plastic,” she said, meaning flexible or moldable. “When you say Thai, we can be Thai Mon, or other ethnic groups,” she said. Today there is no separation of the economic clout of the Thai Chinese community and that of Thailand’s business sector; to all intents and purposes, they are one and the same. By one estimate, up to 90 percent of shares in Thai corporations may be held by Thais of Chinese extraction. There is, thus, unlike in some other countries in the region, little or no issue of resentment against ethnic Chinese ― because they are Thai. Dr. Supang, an expert on migration, noted that there have been conflicts between Thai and Chinese. During World War II, Japan and Thailand were close, and because of Japan’s conflicted history with China, Chinese living in Bangkok were seen as a problem. That all changed with the rise of communism, she said. Being communist meant you opposed the Thai monarchy. “The Chinese had three options ― leave Thailand and join the Communist Party in China, maintain dual identities or adopt a Thai name,” she said in an interview. They chose the third option. It was also relatively easier for the Chinese to integrate. Unlike in Indonesia and Malaysia, Buddhism was a common thread. Some families still have links with their old families in China. 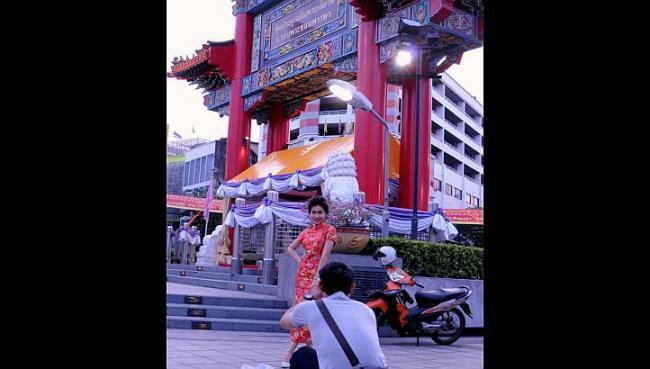 The wealthier send money to China once in a while, and distant relatives from China visit Bangkok. But the links are becoming more and more tenuous.